A fire broke out at a temporary supportive housing site in Nanaimo Monday night, displacing 20 residents. Flames were seen shooting from a structure at Newcastle Place in the 200-block of Terminal Avenue shortly after 5 p.m. Firefighters arrived to find flames and heavy smoke pouring from one of the buildings at the site and made quick work of the fire. "We were serving dinner and the residents, most of them, were over in the dining area and that's when it happened," said Violet Hayes, Executive Director of Island Crisis Care Society, which operates the housing site. The buildings were evacuated and none of the residents, staff or first responders suffered any injuries. One of the buildings sustained heavy smoke damage and the society is now trying to find temporary accommodations for the 20 displaced residents. "It's a lot of trauma for the people because everything that they own is in those rooms," said Hayes. As the society tries to assist occupants, it is also looking for bedding including things like pillows and sheets, Hayes said. Anyone who wants to donate is urged to contact the society at 778-441-4227. 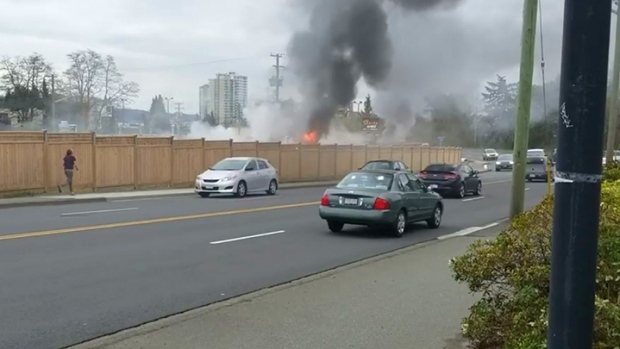 Nanaimo fire officials say the cause of the blaze remains under investigation.